Apple Card shouldn’t be the first card you reach for in your wallet. By now, we’re all familiar with Apple’s marketing speak about how its products will change everything. It trotted out similar language at its services event yesterday when introducing the Apple Card, its credit card with Goldman Sachs. But now that we have the facts, is it actually worth getting an Apple credit card? Eh. Let’s break it down. As far as rewards go, the Apple Card doesn’t really stand out from the pack of cash back cards that are already out there. That’s because it’s so tied into Apple’s own ecosystem. If you use Apple Pay, you get two percent back on all your purchases and three percent back on Apple purchases. You only get one percent back if you’re using the physical card itself. (Of course, Apple offers Apple Pay, and you’d be foolish to insist on just using the physical card at an Apple store.) Overall, two percent back is pretty standard these days for rewards cards. Nothing mind blowing, but also not horrible. That said, its Apple Pay-centric features are the first hitch. While contactless payments are on the rise, and a decent number of stores and apps work with Apple Pay, it’s not ubiquitous just yet. A Forrester survey commissioned by JP Morgan in 2017 found that only 16 percent of U.S. consumers had used a digital wallet, and only 36 percent of merchants accepted digital wallet payments. So to get the most out of your rewards, you’d have a much narrower scope of where you can actually use this card. If you’re someone who prefers online shopping via the web or at say, your local bodega, you’ll be stuck with the one percent cash back benefit...which is kind of paltry. I am definitely not spending enough to get this much cash back on ONE card every month, and neither are most people of reasonable means. But say you’re buried deep in Apple products. Three percent back on, say a $1,000 iPhone XS. You’re only going to get $30 back. Yay? That’s not really a huge incentive to run off and buy a shiny new gadget. Even a look at Apple’s mockup of your monthly cash back is either misleading or crafted by a bougie Silicon Valley elitist. To get $46 in cash back in a month, at a rate of about 2 percent means you’re spending quite a bit. Take the $15.87 in cash back from Bloomingdale’s. Since that’s not an Apple Pay partner, I’m assuming this person bought their stuff in person using a card. To get that much back, this fictional person would need to spend $1,587. For the rest of us poor, huddled masses the returns would likely be much, much less. That’s not to say the card is without perks. It’s great there are no fees—annual, late, foreign-transaction, penalty, or otherwise. That said, Apple’s language regarding interest rates, however, is somewhat misleading. It says the goal is to provide among the “lowest rates in the industry,” but offers rates ranging from 13.24 percent to 24.24 percent—again, pretty average—based on creditworthiness. Still, getting your cash back on a daily basis is also convenient. Most cards will make you wait until a balance is paid off, or your statement period ends. And, it is helpful that you can then use it to buy things via Apple Pay, pay back friends via Messages, pay off your balance, or just transfer it to your bank account. But aside from the last option, it’s heavily built-in to the Apple platform. Also, in terms of financial awareness, it is nice that Apple’s built in machine learning to help you see where you tend to spend. But it does raise at least some questions about data. 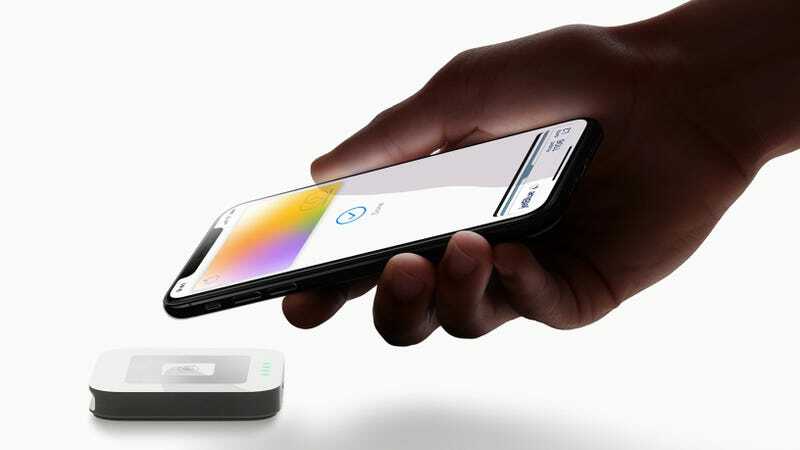 Apple claims the card is a privacy beast, with a special security chip that requires authorization by either Face ID or Touch ID, as well as a one-time unique dynamic security code. But it also says that Apple has no idea where you’re shopping, what you bought, or how much you paid. It also says Goldman Sachs will never share or sell your data to third parties for marketing and advertising. There’s a question of how it can use machine learning and Apple Maps data to color-code your purchases so you’re aware of what your spending, while never knowing at the same time. According to Apple, if you have Location Services turned on, where you are when you make a purchase may be sent anonymously to Apple, but that info wouldn’t be tied to your Apple ID. This commitment to privacy is a step in the right direction. Currently, credit cards and banks can do a lot with your transaction data, and consumers don’t really have a huge say in the matter until better legislation is passed. At the end of the day however, this is not a card for everyone. It’s so heavily built into Apple’s hardware and software that there’s absolutely no point for Android users to even look at it. Not that many would, mind you. But if you’re an Apple user who’s maybe toying with the idea of switching to a Samsung phone, this isn’t really a card you want for the long term. There are also plenty of cards out there with similar or better rewards, that don’t lock you into one technological platform, or limit the areas where you can shop in a bid to maximize benefits. If you’re just starting out building credit and looking for a good starter card...this ain’t it. (Maybe, check one of these.) But if you’re thinking of opening your second, third, or fourth card? Eh, you could do better. You could also do a lot worse.